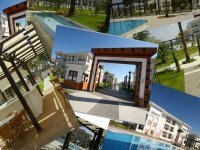 Click on an area above to begin your search Welcome to our selection of holiday homes in Turkey. There is a large selection of holiday homes to rent in Turkey from luxury villas overlooking the Mediterranean to city center apartments in Istanbul. Turkey is the meeting of the West with the East and has a fascinating history making it a great place to visit with its wide diversity of culture. Welcome to our selection of self catering holiday accommodation in Turkey where you can hire holiday rentals direct from the owners.